Life Cycle Assessment (LCA) is a methodology that considers the resource impacts of a product or service from inception to end. In a typical building project, the complexity of the supply chain and the fragmented nature of the process pose challenges to implementing a methodology like LCA. Yet, there is mounting research activity and industry interest that supports the benefits of an LCA process. BIM technology supports LCA by helping to answer complex questions about project information and buildings operations processes. The International Organization for Standardization (ISO) has created a formal collection of standards for evaluating environmental impacts. These standards offer a framework for assessing product environmental impact from materials extraction and processing, through product use, de-commissioning or discarding. There are also emerging companies, such as Sustainable Minds, which deliver web-based software and services which support Life Cycle Assessment in design and help companies consider the implications of early stage LCA. 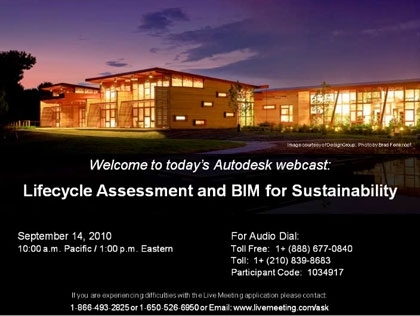 As connections evolve between technology and assessment approaches like LCA, and as new organizations emerge to support and evangelize LCA, customers will have the tools to make the best decisions about design and construction, leading to more efficient building processes & performance, and supporting goals for sustainability.